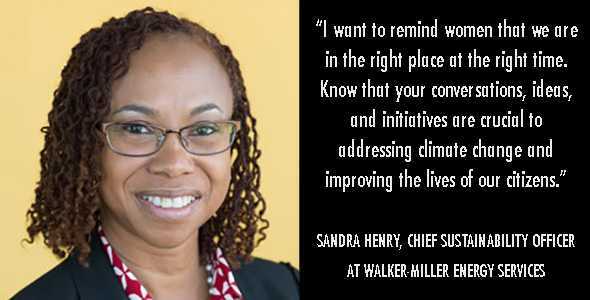 Meet Sandra Henry, Chief Sustainability Officer and the Illinois Director of Operations for Walker-Miller Energy Services and IMT board member. My recent experience in the field has supported what I have suspected all along: Buildings continue to be the greatest contributor to greenhouse gas emissions. For the city of Chicago, buildings are responsible for about 70 percent of the city’s emissions. When I was Chief Sustainability Officer of the city, it really struck me that our residential single-family and multifamily buildings are key contributors of those emissions. About 28 percent of the city’s total emissions are from residential buildings. That’s huge. We are already doing all the right things for commercial buildings—we understand what building equipment wastes energy, we have the right technology, and we are making it increasingly easy for commercial building owners to install high-performance equipment. We must continue to refine and expand these opportunities, but we also need to do the same for homeowners and smaller multifamily building owners to ensure that they have access to these opportunities and that they are excited to improve their properties. Progress in the residential sector is largely a matter of outreach. We need to get better at telling the story of an energy-efficient home and making efficiency resonate with everyone. A typical resident’s priorities are getting to work and taking care of their families—not energy efficiency—so we also have to make it easy for them to act. Finally, buildings are critical to support low- and moderate-income residents. They need affordable heat, light, and electricity in their homes, but most energy efficiency efforts have not successfully identified how to reach out to them and reduce their energy burden through cost-effective, valuable energy efficiency improvements. This is an opportunity to improve buildings as well as the lives of their occupants. I am most proud of the forward momentum I have helped establish throughout the energy industry. I used to work with utilities to develop their energy efficiency programs, and those utilities continue to prioritize efficiency and continue to innovate. And, the programs I helped them develop still have resonance with the market and are still helping people save money. I’m also pleased to see the impact of the cutting-edge pilots I helped develop to advance high-performance buildings by improving the relationships between developers and building owners and identifying strategies for them to collaborate on energy. Today, the developers I worked with are still having those conversations, and they continue to work toward achieving high-performance buildings in every project. Finally, as the former Chief Sustainability Officer for Chicago, I’m happy to see that the city has built on the progress we made and introduced a goal to achieve 100 percent clean, renewable energy by 2035—and that both 2019 mayoral candidates adopted this goal as part of their platforms. Energy efficiency is an exciting space because successful technologies are growing, we are regularly identifying new innovations, and there are so many options available to push us to the next level of high-performance buildings. But, for real market transformation, I’m looking for a pathway to pull all these technologies together and begin to approach every building as a comprehensive system. Rather than working piecemeal to improve a building’s lighting or install one new piece of equipment, we should prioritize improving the entire building. This comprehensive approach requires a renewed focus on the people, families, and businesses we seek to serve through significantly improved buildings. It’s a matter of customer values and experience: We must take into consideration each customer’s journey toward improving their buildings, prioritize deliberate outreach, and be creative about incentives and finance opportunities so that everyone can say “yes” to better buildings and energy savings. I want to remind women that we are in the right place at the right time. Know that your conversations, ideas, and initiatives are crucial to addressing climate change and improving the lives of our citizens. Finally, always look out for the next thing—stay grounded in the moment, but always look for the next opportunity to grow. You never know where it’s going to come from.